Update, January 20th: The rollercoaster saga of the troubled JRPG continues, as the PC port becomes indefinitely delayed once more due to new technical issues. Citing recently discovered technical problems including frame-rate drops and memory leaks, publisher NIS America have opted to delay the PC release from January 30th to an as-yet-unknown date, while they bring in an entirely new development team to work on the technical issues. According to a press release from NIS VP & COO Mitsuharu Hiraoka, the root cause of the problems is an early assumption that the PS4 version of the game could be ported quickly and easily to PC without altering the base code. After internal beta testing, they have realised that is not the case. Ys exists on the more arcadey, hack n’ slashy end of the RPG spectrum. If you want something a little thicker and more stat-dense to chew on, check our list of the best roleplaying games on PC. It’s not bad news foreveryone, at least. While the fate of the PC version is currently unknown, NIS America have at least confirmed that those who already bought the game on PS4 and Vita will recieve the re-translation as planned. For the rest of us, NIS say that they’reoffering full and unlimited refundsfor those burnt by this comedy of errors, at least via Steam. It’s a real shame that this launch of Ys VIII has been so messy. On a slightly happier Ys-related note, Sara Leen, coder over at former series publisher XSeed still has plans to patch and improve on many earlier Falcom titles, including some earlier Ys games. Probably the biggest feature planned is adding voiced dialogue to Ys: Oath in Felghana, ported over from some other platform’s release of the game. While nothing is set in stone (this is all entirely above and beyond the call of duty), those would be a nice set of upgrades to get. Original story, January 14th:Ys VIII: Lacrimosa of Dana has had a rough time. Originally launched last year on consoles, it was consistently (and rightly) mocked for its rushed and sloppy translation, taking one of the most story-driven games in the venerable action-RPG series and somehow fouling it up to the point where even the existing english text in the Japanese script got re-translated intoworseEnglish. After several months of delays and a total rewrite and re-record, Ys VIII is finally ready for prime-time, and is hitting Steam at the end of this month, January 30th. It’s very much a case of better late than never. The Ys series has been consistently entertaining since the very first game way back on early computers in 1987, and red-haired protagonist Adol Christin hasn’t aged or changed a bit in 31 years. He’s still timelessly young, selfless, heroic and utterly free of angst and drama. He’s learned to talk a little bit more over the years, but he is to RPGs as Mario is to platformers, and the series has seen a major resurgence on PC these past few years thanks to remasters, ports and retranslations, mostly via publisher XSeed. For countless years, Adol’s life has been a never-ending cycle of wandering into a strange new land, meeting the locals, finding out that they’re being menaced by an ancient evil of some kind (usually some gods), and stabbing the heck out of them with a smile (the gods, not the locals) before wandering off into the sunset. 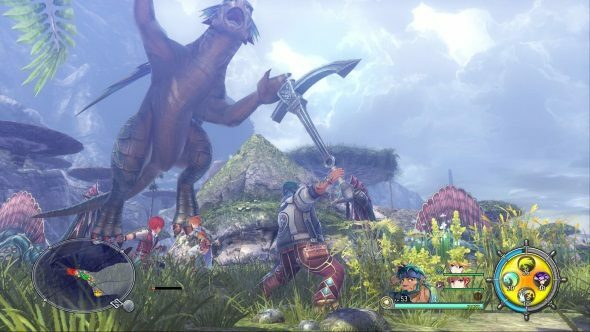 Ys VIII finds him and a crew of mismatched adventuring-types shipwrecked and lost in a hostile land, building up a home base and questing to get to the bottom of whatever dysfunction is affecting this new island realm. As with the latest few Ys games, Lacrimosa of Dana is a little less twitchy and arcadey than the middle-numbers in the series, opting for a slightly slower and more technical combat engine that allows you to switch freely between party members mid-fight in order to deploy each character’s special attacks as you see fit. That’s not to say that it’s a slow game at all, but Adol is no longer a one-man army/human Cuisinart capable of mashing the attack button and wading sword-first through any horde of monsters. Ys VIII: Lacrimosa of Dana is set for release on Steam this January 30th, with an RRP of £45/$60. While that may seem a little high, the current Humble winter sale features most previous Ys games at heavily discounted prices. I’d recommend trying Ys Origin or Ys VI to start with. It’s an easy series to fall in love with, which explains why it’s been running for over thirty years now.